Today we left the Red Fox Casino in Laytonville, and started to make our way to San Francisco. I was so exited to start seeing vineyards, spectacular farm land and of course Palm Trees! Finally our luck with rain might change as we make our way deeper into the South. A few miles before Santa Rosa, Doug decided he had to make a pit stop, so we took an off ramp and headed down main street looking for somewhere to pull over and park our rig. As I looked to the left and right of me, I could see stores like Taco Bell, boarded up and and closed. I couldn’t figure out why! Sort of dumb to have so many businesses closed, and on top of that there was very little traffic. It felt like we were entering a ghost town or something. When we pulled to a stop, we sat there taking in the sights of our surroundings. Then it dawned on us. 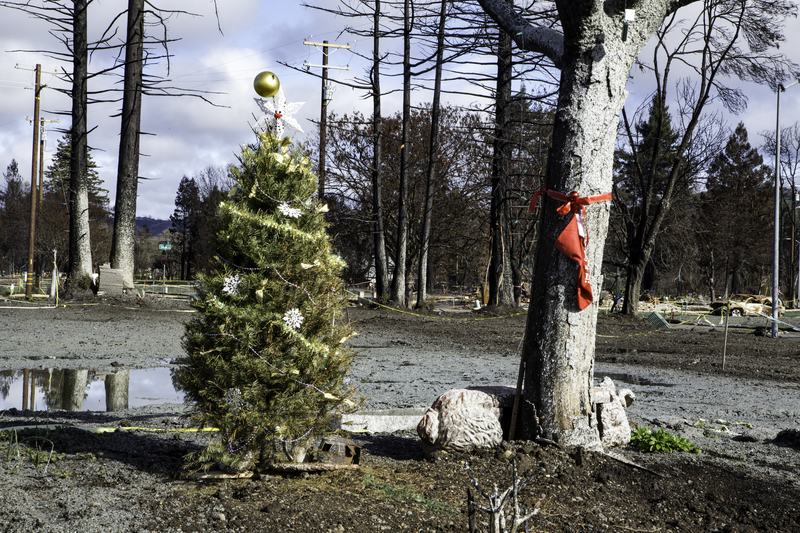 We were in a place they called Fire Valley… the remains of a vibrant community wiped out by the horrific California fires we had seen on TV while we waited to cross into the the USA in December. For as far as the eye could see…. there was nothing. Obviously they had started the clean up, as many of the lots that had once been home to families were levelled and marked off with yellow tape. It reminded me of the Fire Storm we had had in Kelowna back in 2003. It was haunting. Doug took Chicago out to stretch her legs, and I grabbed my camera and started to walk around the desolate streets. 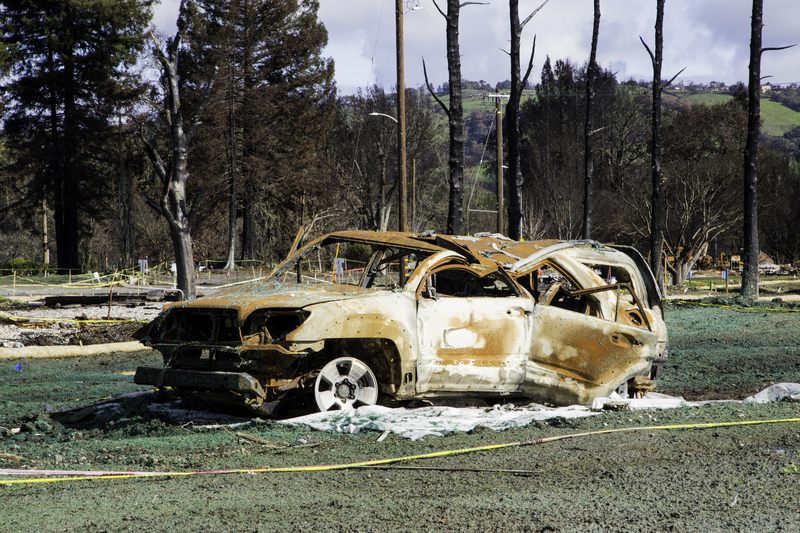 Some lots had been mostly cleaned up, while some still had the remains of torched appliances, furniture and cars. The one thing I that caught my eye is that on virtually every lot there was a lone decorated Christmas tree. I spotted a woman down the road walking a small dog. She stride was slow and sad. As I approached her, I could see the exhaustion on her face, and the slight tremor of her her hands as she held onto the leash of her little companion. She looked pleased to have someone to talk too. She had a story and she seemed eager to share her experiences of what had taken place. Her name was Penny. A young woman in her 30’s with a blond pony tail, and deep sad eyes. Apparently when the fire hit, it came like a roaring thunder that no one had seen coming. People scattered to their cars in complete panic to try to out run the blaze that was racing towards them. Very few had any belongings in their hands. For weeks the residents poured over their property looking for anything they could salvage. Penny was near tears when she told me that out of the whole community, she returned to find her house standing and one across the street. Everything else was gone. The police had gone to her house after they had been initially let in to see the destruction, and told her that although her house was still there… if she left she would not be allowed back in, and they could not insure her safety with the hordes of looters trying to come in from every dark crevasse in the middle of the night. “What was I suppose to do? We had no power, no street lights… we had to leave.” My heart broke for her as she continued her story. I asked about all the Christmas trees. She told me that on Christmas Eve… the residents returned and each put up a tree, decorated it and celebrated Christmas in the streets with each other. Someone brought in a horse and wagon, so they had hay rides, Christmas carols and hot chocolate together. It was a tight community…. most had been there for decades, and many had young children who had played together for years. 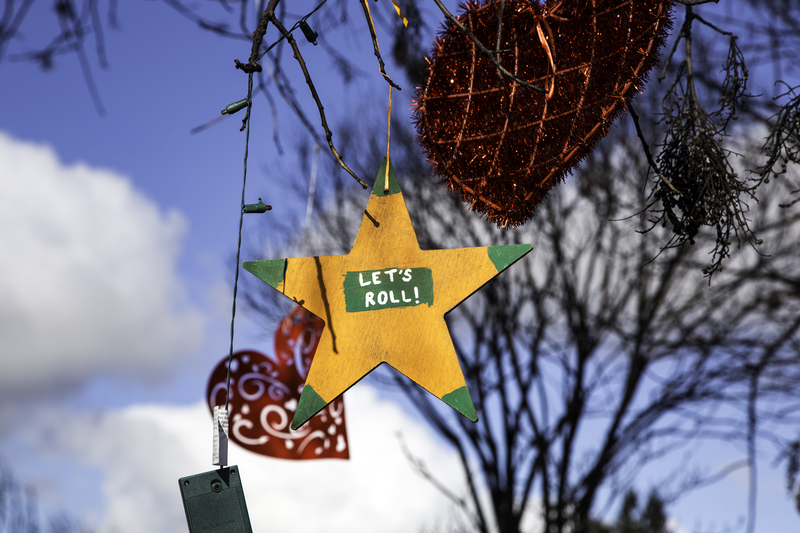 As she was speaking I looked around and noticed all of the trees people had hung hearts on with messages of hope and the determination to build again. It was then she told me, that for the most part that would never happen. Many of these home owners have mortgages on their homes. They have had to find other living arrangements and work. Some of them great distances away, and others had to leave the State. 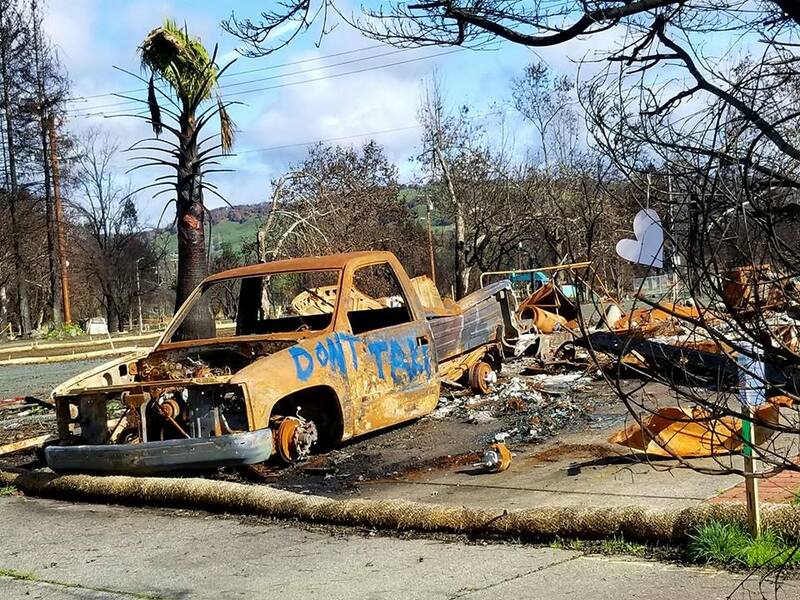 With the cost of living out, and the level of price gouging that was going on for victims of the fires… many had no choice but to put their lots up for sale, take what ever insurance money they could collect and move. Having lost out home to fire and everything we owned, I knew what she and many others were going through. We talked at length, and when we parted we embarrassed in one of the tightest and longest hugs I had ever had. I told her would would keep her in our thoughts and prayers. I feel the need to make mention of this, in case anyone in the area is in a position to help Santa Rosa. Apparently most of the residents left without having the time to load up their dogs, kitties and in one case a beloved sea turtle. There are signs posted all over for those who are trying desperately to find their beloved pets in case they survived. However, on the other end of the spectrum… Penny broke into tears when she told me that the local shelters were over flowing with pets people did not return for. If you live in the area… perhaps you can recuse one of there babes who have not only been through a horrific nightmare, but have also lost their humans. Coffery Strong!!!!!! 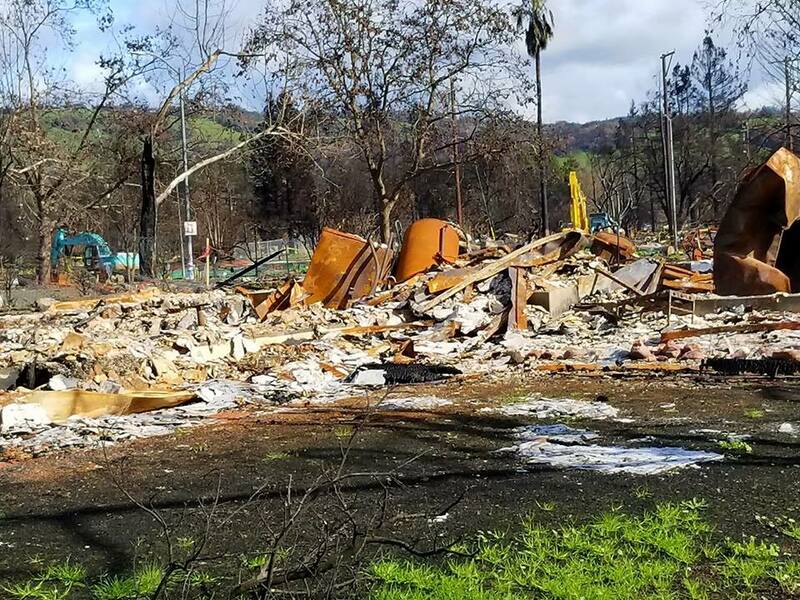 Santa Rosa will rebuild… but they have a very long ways to go. As we drove away, Doug and I felt a deep sadness in our hearts. To hear about it is one thing. To see it first hand is quite another. I can NOT even begin to imagine what theses poor people have gone through. Even though the tornadoes here, a few years ago, wiped out most everything in it’s path, we were lucky and had no damage. Also, unfortunately, when people’s lives are in danger, there are a lot of PETS left behind. Since I volunteer for our humane society, I have helped rescue some of these poor dear, sweet pets myself and it is so very sad. GOD LOVES ALL OF US. PPL went through. Truly makes one appreciate what we have.